Most of our clients, though, work in large and medium sized law firms in big cities. They likely try more cases outside of their home town than they do within it. They likely appear in court more often on a pro hac vice (temporary) basis than they do in the jurisdiction where they are admitted to practice. So for these lawyers and the teams that support them, it can be a real challenge to understand your judge’s likes and dislikes. Local counsel’s anecdotal statements can be helpful, it’s true. All too often, however, they are hard to get much value from. Local counsel can usually tell you whether the judge has tried many cases like yours, something about his or her demeanor, his or her tolerance for outsiders, along with a sense of what arguments work. Like using Yelp for restaurants however, you have to judge not only the quality of the review but also the preferences of the reviewer. In some jurisdictions, such as the Eastern District of Texas and the District of Delaware, local counsel know the judges well enough so that you can come to understand a judge's likely approach to your case. However, if you want more information, there are other techniques that make sense. 1) Watch the Judge: Above all else, if your client has the budget, there is no substitute for watching your judge hear motions and preside over a similar case. 2) Commission a Judge Study: Our senior trial consultants prepare detailed judge studies that will help inform the tactics you use at trial. 3) Conduct a Mock Bench Trial: We are big believers in mock bench trials. The benefits are many and include: 1) forcing yourself to practice early; 2) hearing advice from colleagues of the judge; 3) getting a sense of what works and what does not. We have previously offered some great tips for conducting mock bench trials and getting great results. 4) Find Past Clerks: Here is an advanced Google search for finding former clerks of a judge. For this and other sample searches below, replace the judge's name and district as appropriate. 5) Research Any Controversies: Here is an advanced Google search for ferreting out controversies or scandals a judge may be involved in. 6) Research Memberships and Affiliations: Here is an advanced Google search for researching the memberships or affiliations of a particular judge. 7) Consult Judgepedia: This site is a comprehensive, up-to-date site that contains vast amounts of current information on federal and state judges. Modeled on Wikipedia, it gives useful background data on thousands of judges and on the state and federal court systems. 8) Visit The Robing Room: This judge-rating site is valuable because the feedback from lawyers is anonymous. 9) Visit RobeProbe: Here is another judge discussion site with reviews from lawyers. This site also has a number of international lawyers listed. 10) Research Donations: Here is a site to research donations to Pennsylvania judges' campaigns. Donations to campaigns regulated by the FEC are listed here. 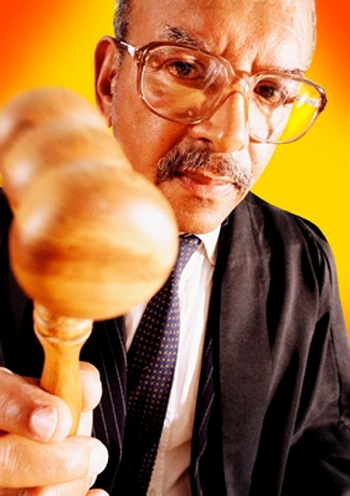 11) Consult Social Media: Some judges are on LinkedIn, some are on Facebook and some are even on Twitter. It's up to you to find out. Our guide to social media for litigators will be generally helpful. 12) For Federal Judges, Read the Almanac of the Federal Judiciary: Unless you find a copy on Westlaw/Lexis or in your local law library, this tome will set you back almost $2,000. Still, it has a lot of useful information about judges including notable rulings, impressions of lawyers who have experience with the judge, as well as demeanor analysis and more. 13) Use Westlaw Tricks: Here is a guide that Westlaw offers for researching a judge. 14) Use Lexis Tricks: Here is a link to a PDF from LexisNexis entitled Researching A Judge. It has some useful tips if you use Lexis. Here are a variety of resources that Lexis lists as well. 15) Use LawProspector Tricks: LawProspector is a service designed primarily to help litigation support business development efforts, however litigators can use it to quickly see other attorneys who have recently had a trial or hearing before a particular federal judge. It starts at $299/month, so a one-month subscription might be useful to find out who can give you some good advice. 16) Local Websites: Many jurisdictions, like Pennsylvania, New York and Florida, have detailed information about state court judges online. 17) Visit the Federal Judicial Center: Here you will find some useful information about federal judges and there is a focus on history here as well. 18) Subscribe to TRAC: This tool covers cases since 2004 in the federal judiciary and claims to "provide a unique way to examine the year-by-year work product of individual federal district judges." You'll find it here. 19) Visit Judicial Watch: This site attempts to collect financial disclosure information about particular judges. The coverage does not appear to be extensive in the federal courts, but you might luckily find your judge listed here. 20) How Long Will That Motion Take: Here are a variety of lists of slow moving judges in the US Courts. 21) Local Counsel: Of course you should talk to local counsel. This blog article from Texas law firm Charhon Callahan does a great job of explaining the value of local counsel and what to look for when selecting them.